A New and Accurate Map of Poland, Lithuania etc. Divided into its Palatinats. 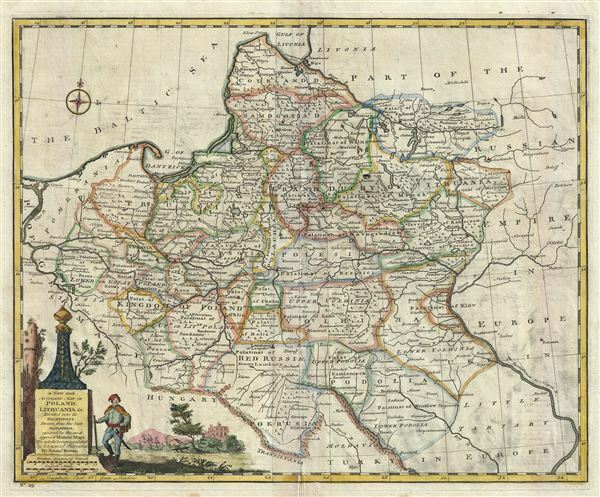 This is a beautiful 1747 map of Poland and Lithuania by the British cartographer Emanuel Bowen. It depicts the different Palatinates or administrative divisions of Poland and Lithuania as well as parts of Germany, the Russian Empire, Hungary, Transylvania, and Latvia. Several important towns, rivers, roads, cities and other topographic features are noted, with mountains rendered in profile. The map is color coded according to the Palatinates. A beautifully illustrated title cartouche is included in the lower left quadrant of the map. This map was prepared by Emanuel Bowen as plate no. 29 for the 1747 issue of A Complete System of Geography. Very good. Minor wear and toning along original fold lines. Dampstains along outer margin, not extending onto printed area. Minor offsetting. Blank on verso. Rumsey 3733.028. Philips (atlases) 614 (1752 edition).